We’ve said it before and we’ll be saying it again (and again and again…), 2018 is THE year of sustainable beauty and fashion. Since April is Earth Month and with spring in the air, what a great time to jump on the trend — if you haven’t already, of course. If you’re not already, follow our Spring into Sustainability tips to green up your salon and life in general. However, there are some popular trends you can jump on right now which you can start utilizing in your shop and passing along to your clients. Natural, individualistic styles are what’s in for hair this Spring. Beachy waves, a lot of texture, and short pixie crops are what we’re already seeing everywhere. These styles are easy to maintain if you have the correct styling products. You know by now how much we love Davines, it’s a HUGE part of what The Movement is all about. 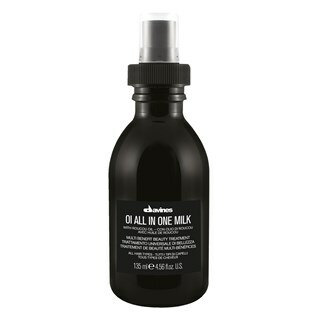 There’s a Davines product for every type of hair along with fantastic face and body care, as well. If you’re still not sure where to start, read our top recommendations here. 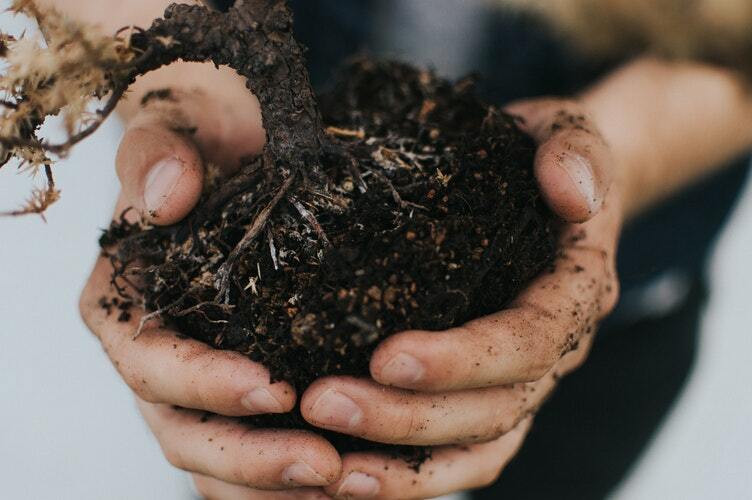 Getting involved with Davines during the month of April helps support Sustainable Beauty Month and Davines has decided the Fruit Tree Planting Foundation is this year’s most deserving recipient. This foundation aims to plant 5,000 trees in Peru where about 357 local families will benefit. And be sure to support the event by following #SBMONTH2018 on your favourite social media platform. Beauty trends this Spring are fresh, clean looks with a hint of glitter. Keep it natural, except for when you want to POP! Clean beauty products are picking up steam and becoming more popular all the time. Choosing beauty products which aren’t filled with dangerous chemicals benefits your skin as well as the earth. A lot of popular brands are dropping the more dangerous chemicals from their products which is a huge step in the right direction, but we still prefer to support original eco-friendly companies such as Jusu. This fabulous company was started as an organic juice bar in Victoria, BC in 2014. Using the vitamin and mineral rich pulp from the juice resulted in them creating clean, organic products to nourish the skin and body. What a great way to be healthy AND eco-friendly. Sustainable fashion is a whole lot more than just plain, flowing hemp dresses. Most designers are becoming more mindful of the fabrics they’re using, incorporating more sustainable materials while still producing on-trend garments. Fur (mostly faux, luckily) has been spotted on boots, hats, purses, and everywhere else you can imagine for the past few seasons. Enter “denim fur” for us eco-conscious trend followers! Created by ISKO (the world’s largest producer of denim) along with “designer of nature” Fashion designer Tiziano Guardini, this “fur” is made from certified-organic cotton and pre-consumer recycled cotton. We’ve been seeing tons of reviews and praise for these sustainable cotton creations on social media. This means you can be in style while still being eco-conscious. The Salon Movement is devoted to filling the world full of stylists who care about the planet, culture and craft. There’s no better time to join us than now. April is EARTH MONTH! The Salon Movement and its awesome partners are already committed to living as green and eco-friendly as possible and this is the perfect time to get the rest of you on board to helping the earth — and yourself — be a lot healthier. Challenge your family, friends or colleagues this April to see who can be the most sustainable. At the end of the month, find out who has the lowest hydro bill, who reduced their food waste the most, who produced the least amount of garbage — or ALL the above! A challenge with a small prize will motivate people to do their best and learn some good habits that stick with them far past April. It’s the start of spring and most people are excited to shed their boots and parkas and get outside. It’s not too hot or too cold so walking and biking are ideal at this time of year. Commit to using your car as little as possible during April. If biking or walking is not an option for your commute, try using transit or carpooling if it’s available to you. April is the perfect time to start a garden and grow all sorts of wonderful fruits and vegetables. You get some fresh air and relaxation time while being productive. This month is usually the start of community markets where you can get some great local produce. Support your local farmers and learn some new tips and tricks you can put towards your own garden. Take that wonderful crop of veggies you bought and/or grew and find recipes to use them all. Commit to trying at least one vegetable a week that you have either never tried before, or you thought you didn’t like and find a way to love it. Try using vegetables as the base of all your meals this month. We’re not saying you have to cut out meat completely but try to incorporate as many meat-free meals as possible. This will greatly help your health and the earth’s sustainability. Take this month to think about your footprint and budget. Buying items you don’t need leads to increased clutter and less satisfaction for what we have. Make a commitment this month to buy only what you absolutely need. And if you do need something, buy sustainably. Sustainable beauty products, sustainable fashion, and supporting local eco-friendly companies should always be your first choice when you need something new. Grab a group of friends or family and head outside to appreciate the natural beauty and do some good for the earth. Pick up trash at your local park or beach, or plant some trees in an area that needs it. You’ll feel good and, of course, the earth will, too! Did you catch our Spring into Sustainability blog post last month? Be sure to take a read through to find out more ways to help you on your way to being more sustainable at home and at work. If you or your salon is already part of The Salon Movement then you already know all the incredible benefits which come with membership to this amazing community. If not, we’re here to convince you. WHY BE A SUSTAINABLE BUSINESS? You may be wondering what the benefits of being a sustainable business are. You know you’re doing a great thing for the earth, but is that where it ends? Not at all! Sustainability is huge and more people than ever are seeking out sustainable fashion, products and salons. This could mean you! At the beginning, you may need to invest more money to make your salon into an eco-friendly oasis. But the savings you’ll see will occur almost immediately and be well worth it in the long run. Installing water-reducing showerheads and low-flow toilets will save you water, money and energy. Even switching to low-energy power bars and making sure lights and machines are turned off when not in use is a very inexpensive, simple start to sustainability. Using sustainable products and materials is so important to your footprint on the earth. You’ll notice an impact almost immediately and will likely save you significant money if you’re having to contribute to garbage services. You won’t believe how wonderful eco beauty products are these days. The right products will produce fabulous results on your skin and hair and you’ll glow inside and out from not using toxic chemicals. It also feels great to know you’re doing your part to help the earth. WHAT DOES THE SALON MOVEMENT DO? We believe that education is vital to perfecting your skills and keeping up to date on the latest products and styles, especially those to do with sustainability. For some great ways to keep your training fresh, check this out. Movement members also get ongoing webinar training and special Davines product information. If your business isn’t seeing the returns you’d like it to, The Movement can help you realize your extreme potential. We’ve got some really exciting things to share that will take both your career and business to the next level. Marketing is huge for your business, and The Movement can help deliver your sustainability offerings and message to those who are looking for it. The earth sustains, heals, and supports our success and all it requires from us in return is some mutual consideration, respect and love. As Davines ambassadors and stylists, we’ll work together to keep the harmony. In addition to knowing you’re part of an incredible, sustainable team, you’ll have access to our webinars and education system, as well as receive the latest information on all new Davines products. You’ll also get tools for growing your business and receive promotions and discounts from our sustainable partners. We have different sign-up options for stylists, salon owners and Davines partners, and content is customized to fit you. Join us now. Spring is arriving next week and for most of us, it will be welcomed with open arms! It’s the perfect time of year to re-evaluate how eco-friendly you’re being in your life. At both your home and business, there are a lot of things you can do to reduce your water use. If you don’t have low flow toilets or shower heads, get those installed — they’re not as expensive as you may think. Don’t know where to look? We’re big advocates of the products that ECOHEADS offers. Be mindful of water by only turning it on when it’s time to rinse your hair, teeth or dishes instead of letting it run. Install eco-friendly, water-conserving dishwashers and washing machines and only run full loads. And why not put some old buckets outside to collect rainwater to water your garden and indoor plants? Switch to energy efficient appliances if possible especially with the ones you use the most. Assess your lighting and heating options, maybe it’s time to go with solar options. If this isn’t in the cards quite yet, there are other small steps you can take which will help. Turn off all lights and machines when they’re not in use, replace your light bulbs with LED or CFL bulbs, and wear a sweatshirt instead of cranking the heat. Eco-friendly products can be found everywhere these days. If you’re a DIYer, it can be as simple as mixing baking soda and vinegar to clean most of your surfaces! Natural beauty products are better than ever, and you know that by supporting sustainable beauty, you’re doing good for your skin and the environment. 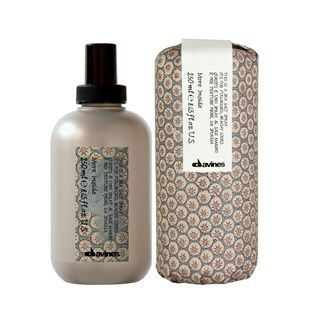 If your salon isn’t already carrying Davines products, what are you waiting for? “Spring cleaning” time is here and this year, you’re not only going to give everything a good clean, you’re going to be ruthless in purging everything you don’t need. It may take some time but go through everything at home and at work and donate or recycle what you don’t need. Keeping old paperwork and unnecessary items can weigh us down mentally and emotionally. So now that you’ve cleared away all your clutter, you certainly don’t need to add any more back in again. Set up a system that allows you to reduce your waste. Don’t print out emails, stay away from disposable products, and recycle everything you can’t re-use. “Fast fashion”, a term used by fashion retailers to describe inexpensive designs that move quickly from the catwalk to stores to meet new trend, is popular these days. Think the stores that offer you shirts for only a few dollars but will only last you a few months. Clothing is becoming a huge environmental issue in the way it’s manufactured and sold. Instead, look for sustainable fashion when you can and know that you’re doing good for the earth while purchasing a quality piece. This is the same for towels and sheets you use every day. Spending a little bit more money on Bamboo or other sustainable fabrics will last longer and be kinder to the earth. Support local markets which carry produce from sustainable, chemical-free farmers. Switch to fair trade items when purchasing coffee, tea and chocolate whenever possible. Spring is the perfect time to start a garden even if it’s just a small container garden on your windowsill. Plants have many everyday uses besides looking pretty. In fact, growing plants that naturally purify the air will help you breathe easier. Aloe plants can be useful for small injuries, instead of turning to chemical-based creams to soothe those small burns or cuts. Growing your own herbs and vegetables is a life changer. You’ll save money plus eating something YOU have grown tastes amazing! If your salon hasn’t already become a part of The Movement, it’s time to make the leap. This will put you ahead of your competitors, and you can rest easy knowing you’re doing what’s best for everyone. Find out more now. “By creating beauty sustainably, we encourage people to take care of themselves, of the environment in which they live & work, of the things they love.” — Davines. If you haven’t already discovered the wonderful sustainable beauty line, Davines, we hope we’ll convince you to give them a try. The Salon Movement is proud to be a unified grassroots movement of sustainably-conscious Davines stylists and salon owners. 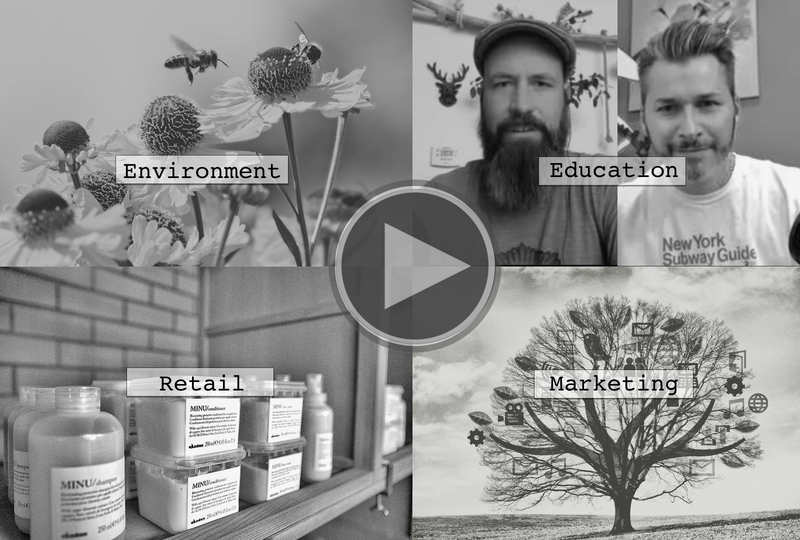 Supporting Davines shows that you care about the earth, as well as your customer’s well-being. 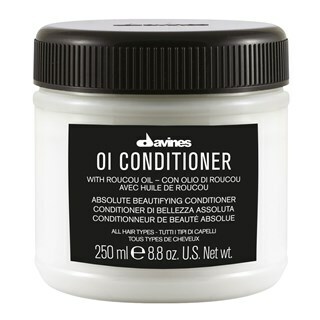 Davines was founded, and continue to produce, in Parma, Italy, with development starting in the 1980s and products being ready to sell about a decade later. Davines truly believes in sustainability and is aiming to be the most beautiful and ethical company in the world. 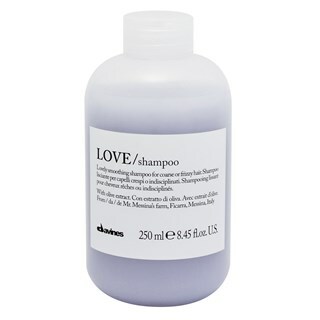 The best-selling LOVE duo from Davines has won a few different awards, and rightfully so! This shampoo and conditioner set is the perfect fit for anyone with dry, unruly hair that is prone to frizz. The olive extracts and vitamin E gently cleanse and add a smoothing dose of moisture. 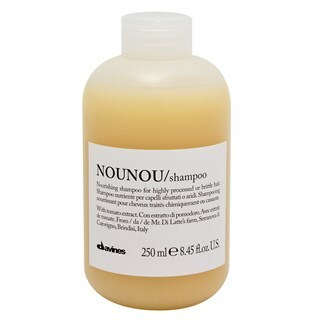 Nounou Shampoo is yet another award winner from the Davines line and, along with the matching conditioner, is a dream. It’s a life (and hair!) saver for anyone who has brittle, dehydrated hair. Fiaschetto tomato is incorporated into the formula to provide the antioxidants and vitamin C which nourish hair completely. Several products in the Oi line have won awards and anyone who has used it has little doubt why. This multi-use line of products is perfect for just about anyone. It has the best ingredients to use on a day-to-day basis, when hair is behaving nicely and has no issues. Roucou oil is the key ingredient in this amazing line to keep hair and skin hydrated and soft. This Is A Sea Salt Spray should be re-named “This is an amazing product!” A best-seller for many reasons, this spray provides amazing texture and style to any hair type and it smells so good! The sea salt in this spray naturally gives tresses the perfect beachy waves many want to achieve without having to head to the ocean. 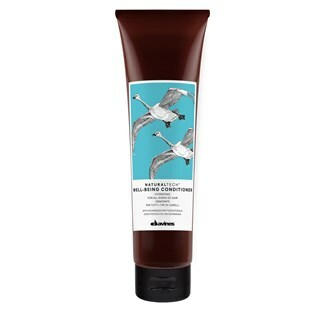 The Well-Being Conditioner is an excellent all-around moisturizer for hair. Made with echinacea plant, this conditioner contains natural antimicrobial products which works to keep hair healthy and nourished. 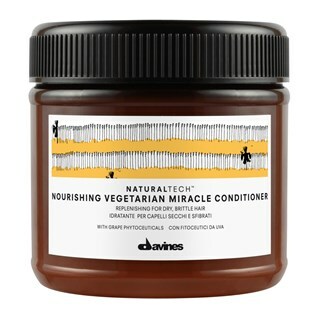 The Nourishing Vegetarian Miracle Conditioner is THE product to use to put life and moisture back into dry, damaged hair. It invigorates from the scalp right down to the ends of your hair to provide intense moisture and prevent breakage. Acai oil is the miracle ingredient which provides your hair the protective antioxidants and restorative benefits it needs. Grape phytoceuticals add an extra source of antioxidants as well as polyphenols to keep hair healthy and strong. If your salon, or personal collection, doesn’t include Davines, that needs to change right now, not only for the sake of beauty but for sustainability. Davines has some very exciting collections coming out involving coffee, tea and honey. We can’t wait for these products, and to see what other revolutionary, sustainable ideas Davines has for our future.